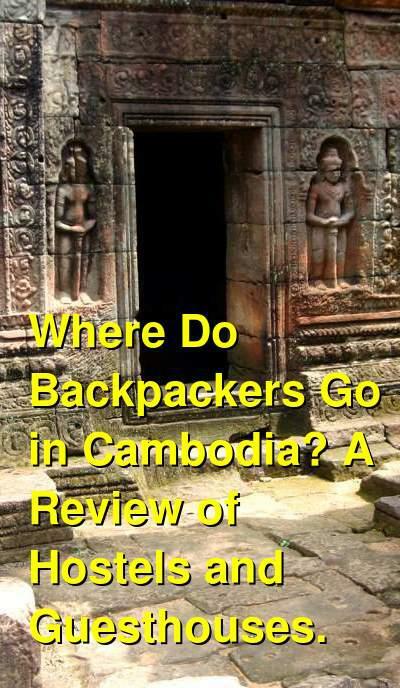 Where Do Backpackers Go in Cambodia? A Review of Hostels and Guesthouses. Cambodia is a popular country for backpackers and budget travelers who are making their way through Southeast Asia. 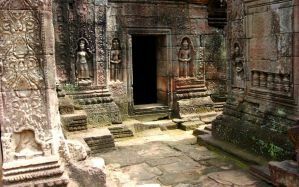 The country has a lot to offer visitors, from the famous Angkor Wat, to more off the beaten path locations. Cambodia is a relatively affordable country to visit, even by Southeast Asian standards. There are hostels around, particularly in the most popular destinations, but there are also cheap guesthouses that offer private rooms for about the same price as a hostel. Where Do Backpackers Stay in Siem Reap? The Old Market area is a popular neighborhood with backpackers. This area includes the famous Pub Street, which is one of the most touristy areas in Siem Reap. The area has countless bars, restaurants, guesthouses, and shops. The neighborhood is a popular area to hang out and there are several night markets that pop up. It shouldn't be hard to meet people and find things to do after a day spent exploring the temples. The Old French Quarter offers colonial architecture and a variety of restaurants, bars, and galleries. There are luxury hotels in the area, with a few budget guesthouses around as well. The area runs between Sivatha Boulevard and the Siem Reap river. This area is on the east side of the river. In the past it was popular with budget travelers, but more expensive hotels have taken over and now you'll find many nice restaurants and trendy bars in the area. Wat Bo is also an 18th century temple that is well worth visiting. This are runs along the National Highway 6 in the northwestern part of town. It runs between a local market, Psar Leu, in the east, and connects to the airport. The area has a variety of larger hotels and resorts. The Cambodian Cultural Village is also nearby, which is a theme park with various performances and elephant shows. Charles de Gaulle Boulevard is the road that connects Siem Reap to Angkor Archaeological Park. The road is lined with expensive accommodation options, restaurants, and shops. Also nearby is the Angkor National Museum. There are very few budget guesthouses in the area. The Riverfront area runs for about three kilometers along the Tonle Sap River and Mekong Rivers. This is one of the most vibrant parts of the city and there are many shops, bars, and restaurants nearby. There are also a mix of luxury hotels, budget guesthouses, and hostels along the riverfront. Boeng Kak Lake used to be one of the most popular backpacker areas in the city, but the lake has been filled in and many of the hostels in the area are gone. There are a few that are still around, and the prices can be quite low as the demand has dropped significantly. This area is where you'll find Phnom Penh's largest market. There are stalls that sell an interesting mix of items and it's a fascinating place to wander around. Also close by is Sorya Mall, which is a modern department store. In the surrounding area you'll find a variety of accommodation options. Prek Leap is a university, restaurant, and nightlife district. There are many restaurants that sell Khmer food, and a large number of karaoke bars. This area is the most touristy and developed beach in Sihanoukville. The northern part is called Serendipity Beach but the area really merges into one. There are a lot of hotels and budget guesthouses in the area as well as restaurants and travel agencies. Backpackers flock to the area for the cheap accommodation and growing nightlife scene. This is a 4 kilometer stretch of beach that is more relaxing than some parts of Sihanoukville. the area is divided into several parts and there are many bars and guesthouses in the area. There a marina with kayaks and boats in the area as well. Wish You Were Here... Backpackers.Bar.Restaurant. This beach is close to the seaport and there are a variety of affordable guesthouses nearby. It used to be the main backpacker hangout but has developed a more negative reputation as Otres Beach and Serendipity Beach have gained popularity. This area has a handful of guesthouses that cater to foreign tourists. Just outside of town there are a few guesthouses along the river.